US-based wireless and cellphone network provider, Verizon Wireless has officially announced 11th May as the shipment date for Samsung U750, which also known as Alias 2 phone. The Samsung U750 has been improved with a variable e-ink QWERTY keyboard that changes between numbers and letters depending on how the dual-hinged 2.6-inch QVGA display with 320 x 240 resolutions is opened. The flip phone will give you a standard phone keypad for phone conversation and it will changes to QWERTY keypad when you used for text typing or text messaging. 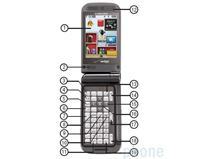 Sports a 2-megapixel camera, Samsung U750 is also pre-loaded with games and media player. In addition, it is Bluetooth enabled, supports voice commands, supports microSD card and has shortcut keys for one-touch access to Bluetooth, text-messaging, voicemail, camera, voice commands, alarms and games. The actual price of Samsung U750 is not yet announced but is expected to be at range of $100 to $130 with a two-year service contract after a rebate.